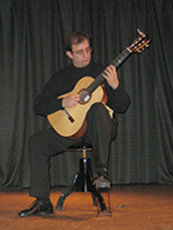 - Miguel Pesce: Solo guitarist specialized in Argentine music y and teacher. Place of residence Bella Vista, Provincia de Buenos Aires. He’s been long dedicated to the study, interpretation and broadcasting of Argentine music. His unsparing persuit of sound in each chord and the respect our past deserves are pillars in his work of art. He has made 8 gigs throughout different countries from Europe such as Germany, Belgium, Sweden, Denmark, Holland, Luxemburg, Greece, Ireland, Austria and Italy. He has made concerts and masterclass in Argentine music at Universities, festivals theatresand cultural centres. These were claimed as High Artistic Interest Gigs by the External Relationship Ministry, the International Commerece and Cult of the Nation, being sponsored by the General Direction of culture and Education, The Cultural Institute of Buenos Aires and San Miguel Town Hall. He was a foundating member of “Cuarteto Monserrat” (folklore Rioplatense) toghether with Vicente Correa (Alfredo Zitarrosa’s guitarist from the 70’s) Gustavo Nasuti, Jorge Mazaet and Zelmar Garín. This group was fundamental in his artistical growth. In the year 2001 they have their first CD “Cuarteto Monserrat”, having Juán Falú, Silvia Iriondo and Patricio Villarejo as guests. In the year 2005 they have their second C.D in the triplet with V.Correa y Patricio Saez de Lubiano, called “Marcela Dumba Aue”. Toghether with Rubén RUSSO they participate in the so called International Festival in the years 2OO5 and 2OO6 and have made 2 European gigs presenting his tango “Vieja Casa” and having Gustavo Nasuti, Sonia Abán, Marcelo Fernández and Jorge Mazaet as invited musicians. He has been chosen by the National Academy of Tango to take part as a solo guitarist in the Gran Milonga del Bicentenario celebrated in Av. de Mayo. He graduated in Juan José Castro Conservatory where he did most of his learning under Victor Villadangos supervision. Moreover he completes his studies in the Popular music school from Avellaneda with Armando Alonso (especialized in jazz) and he also study with Rubén “Chocho” Ruiz and Aníbal Arias in Tango. He has given Guitar and Diplomacy courses in Popular Argentine Music in the University of General Sarmiento Art Centre due to his merit as well. - He participated as a trainer in the Updating teaching training courses in the area of Artistic Education by the area of Artistic Education from San Miguel, Malvinas Argentinas in the UNGS /2008. - He participated as a Guitarist lecturer, in the training and updating open lecture “Genealogy of the Culture and Latin American undersecretary of Art ” organized by the Artistic Education and the San Miguel Town Hall Direction of Education in the UNGS /2004 Art Centre. Miguel Angel pesce Miguel Angel pesce: Sitio personal del Guitarrista y Arrgeglador argentino.